Mt Robson workshop confirmed for this fall! For those of you that don’t know, my good friend and fellow professional photographer Kelly Funk and I have started Discover BC Photo Tours, a series of experiential photo workshops that will take participants to some of the most breathtaking locations in the province, where they will learn the art of photography from two pros. Kelly and I started this endeavor earlier this year and we have now just added our latest workshop to the series – Mount Robson Provincial Park. Up to 20 participants will join us September 16-18, 2011 in the iconic mountain park for two days of photography instruction in some of the most breathtaking locations within the area. The weekend includes a “Camera Basics” session on the first evening to ensure everyone understands the basics of composition, aperture, lighting, depth of field, camera functions, safety and working with wildlife so that our time in the field is maximized. And to welcome everyone to the weekend in style (and to Valemount, BC which will be our base), Tourism Valemount is sponsoring a wine and cheese meet and greet. The next couple of days will be all about field instruction, shooting splurging waterfalls, towering snow-capped mountains, changing autumn colours and potentially any wildlife we encounter along the way. Tourism Valemount has also sponsored the transportation to and from each shooting location for the duration of the weekend. The workshop is perfect for novice, intermediate and/or aspiring pros who wish to elevate their photography. Kelly and I pride ourselves on tailoring the one-on-one instruction to satisfy all skill levels. 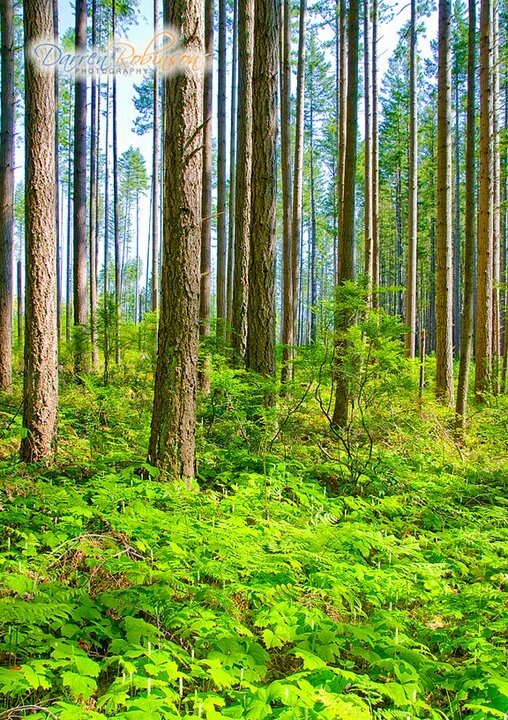 The weekend is $359 per person and Valemount accommodators are offering incredible hotel rates exclusive to workshop participants. The Valemount Hotel has set a $50/night room rate for the September 16-18 weekend! And for an extra $99 per person, you can extend your instruction and join Kelly and myself on Monday, September 19th as we lead you into the infamous Valley of 1000 Falls. This will be an incredible way to put your newly acquired skills to work and to keep the learning going. For safety, we will need a minimum of four participants for this extra day. So if you have always wanted to experience the magic and awe of Mount Robson Provincial Park AND improve your imagery, book your spot today as seats will go fast. You can download the PDF with complete workshop info right here. Being a nature photographer who spends much of his time hiking and biking to location shoots, having the right gear in my bag is a critical forethought to my success. Especially when the unexpected happens. 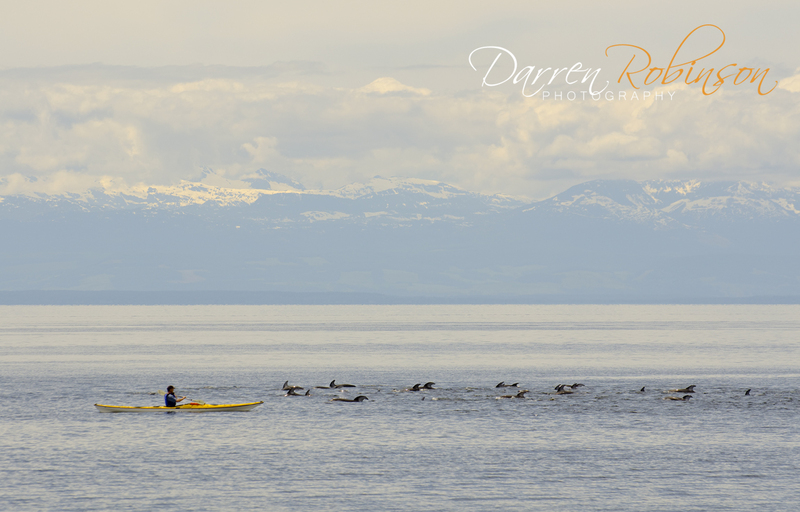 Case in point was this past weekend when an impromptu visit to Willingdon Beach in Powell River, BC presented me with a glorious natural spectacle out on the water. 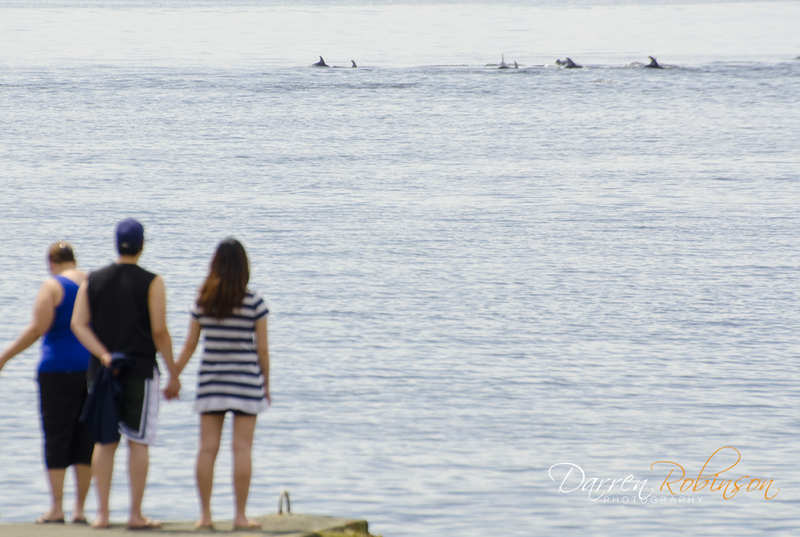 A good 50 or more Pacific White Sided Dolphins wowed the crowd with their feeding ritual that lasted a good 40 minutes. 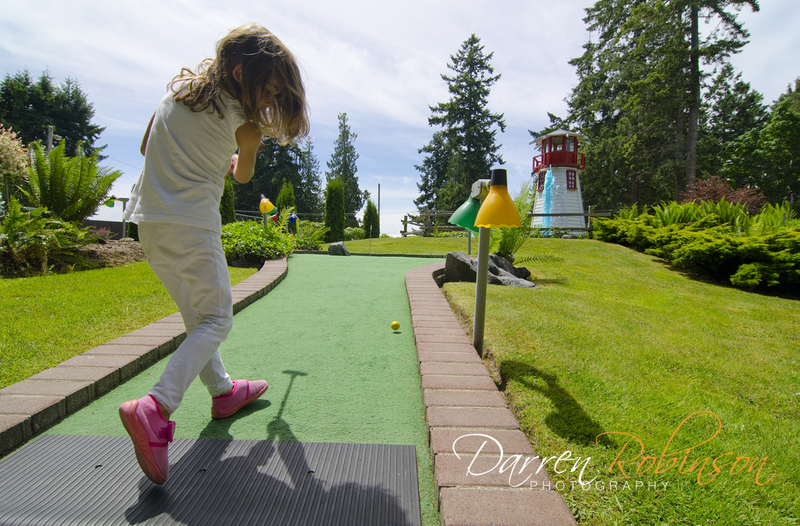 You see, earlier that morning I had decided to take my eldest daughter Sadie for a round of mini golf at Putters, across the street from Willingdon Beach. Of course I wanted to get some shots of the lil cutie swinging away for a hole-in-one, so I dove into my camera bag for a quick inventory before we left. Knowing that the day was warming up and that I didn’t want to be carrying a bag full of gear, I started to consider what I did need for the outing; my D-7000 (obviously), my Tokina 12-24mm and my Nikkor 18-105mm. 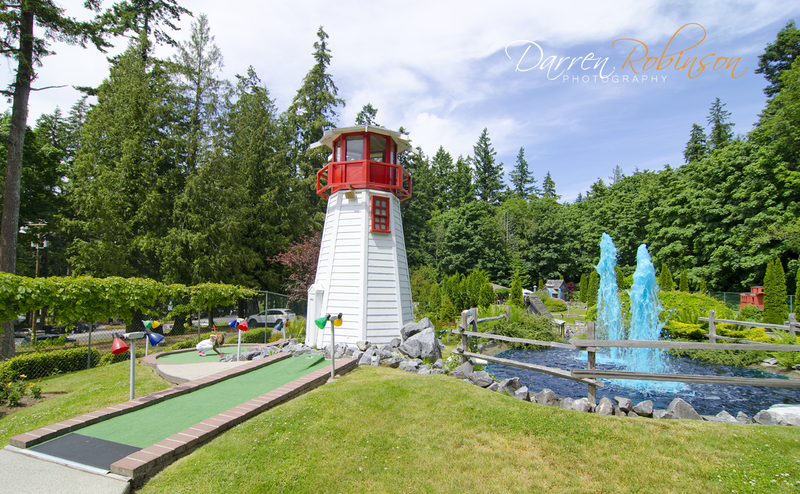 Yup, these goodies should catch the magic of my five year old mini golf star in training. Leaving my Nikkor 70-300mm zoom lens should make my bag noticeably lighter. So I packed it along just for kicks and to satisfy my gut feeling. After our game of mini putt we headed down to the beach to meet my wife and youngest daughter for some play time and ice cream. 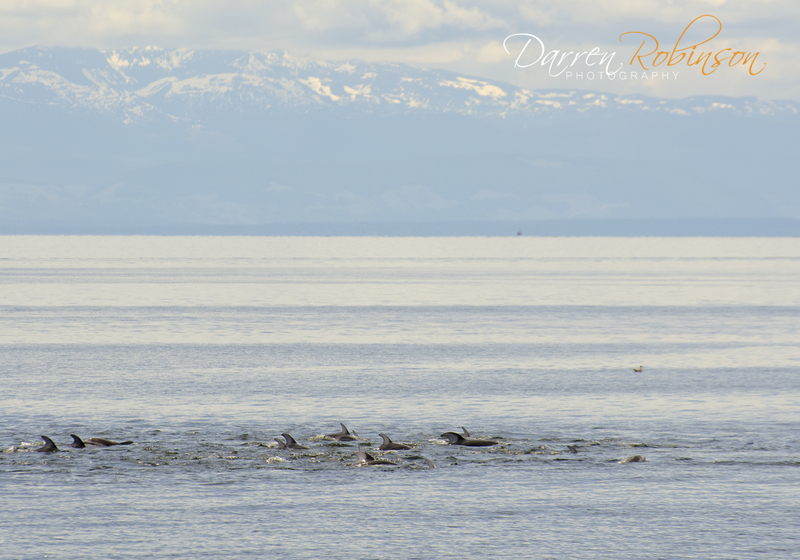 Upon getting to the beach, we immediately noticed a flurry of activity on the water, about 80 yards from shore. “I think those are dolphins,” I exclaimed to Sadie with much excitement. “I can’t see them daddy,” she replied with discouragement. I knew just how to fix that. Out came the 70-300mm which barely made the cut when we left the house just hours earlier. With the help of its 300mm reach I was able to zoom right in to the feeding dolphins and show Sadie what they looked like. 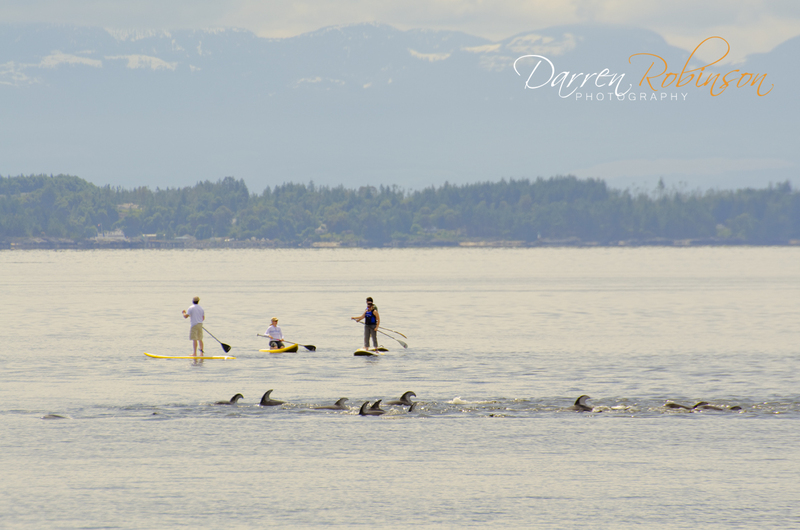 I was also able to fire off a good 20-30 shots of them feeding and interacting with kayakers and paddleboarders. Without the zoom, not only would I have zero proof of this amazing natural encounter, I don’t believe Sadie and I would have even got to see them as they moved further from shore to feed. I keep getting asked how I get my images to look as “crisp” and “sharp” as they appear to be. First, I point them to my workshops page and ask them to consider professional instruction. After all, that is exactly how I started several years back. Then, I let them know that proper focus is the most critical element of crisp, sharp imagery. I know, duh right. But, without proper focus right at image capture, your image is dead in the water. Period. So start by having a good read of your camera manual and get to know its capabilities with respect to focus (focus points, auto vs manual modes, etc). My good friend and Discover BC Photo Tours co-founder Kelly Funk has done a great two-part tutorial on the topic of focus, so I will simply recommend you have a look here. So, you’ve signed up for a workshop AND you have read Kelly’s blog so many times that you could recite it blindfolded, while standing on your head, if so asked. You are now creating images that are properly focused (and properly exposed of course). But, your images still aren’t smoking sharp and crisp. What now? Two words that should from this point forward be forever entrenched in your brains: Unsharp Mask. 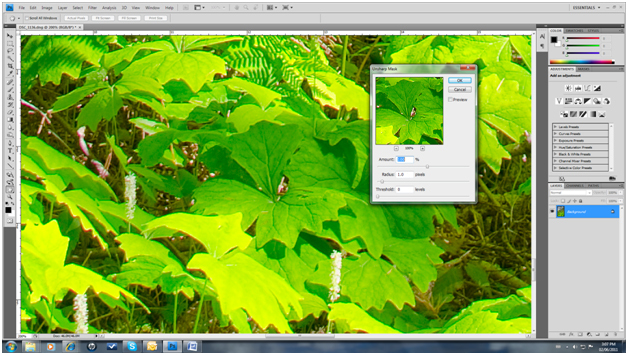 Contrary to its name, the Unsharp Mask tool in Photoshop is an application used to sharpen images. It helps to emphasise texture and details and I use the Unsharp Mask tool (to varying degrees) to finish almost every image I create. It is usually the last step in my work flow before I consider an image done. How does it work? Who cares. But, if you find you do care, then you can learn more about the science of the application right here. In the meantime, for those that just want to see how to apply it and what immediate results it can produce, let’s move on. 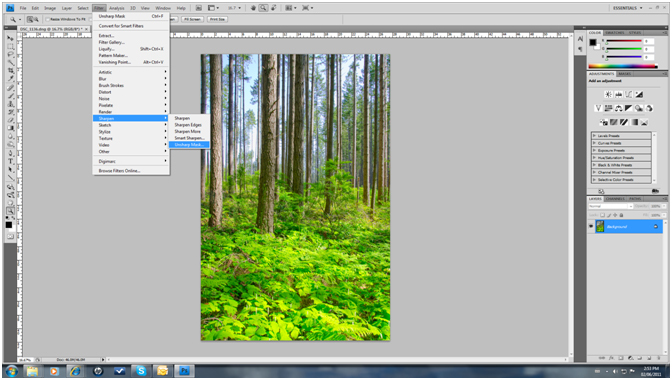 Unsharp Mask can be found in most photography editing software, but I’ll use Photoshop for the sake of this tutorial. The Unsharp Mask window will come into your screen view. You will see three options; Amount (%), Radius (pixels) and Threshold (levels). For me, Radius is always at 1.0 pixels and threshold at 0. It is the Amount lever that I play with depending on the intensity of sharpening I want. I usually add at least 50%, but normally I would add about 100 % to most images. I have gone as high as 175 % in rare cases. Play around and see what results you get. The Preview button lets you see the results before applying the Mask. Now, you may not see dramatic changes (especially at 50 %) to your image in full view. Where you will really see the difference is when you are zoomed into a particular scene within your image. 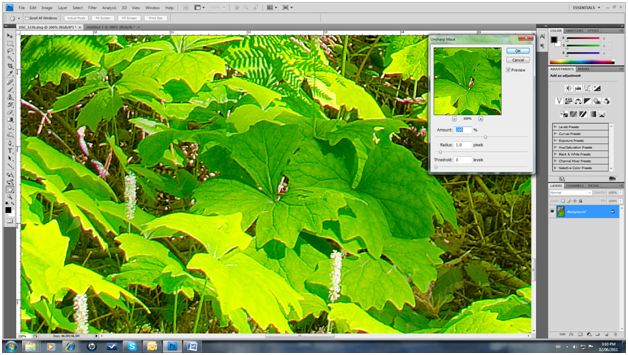 You can really notice new detail on the leaves in the forest foreground after the Unsharp Mask was applied. So have fun with the tool. It may take a little time and practice to really understand the full dimensions of it, but you will notice immediately that your images appear sharper, crisper and more rich in texture and detail.